Casting in horses usually requires general anesthesia. Reasons for casting in horses include heel bulb lacerations, post-surgical immobilization of fused joints or fracture repairs or deep tendon lacerations. Casts require constant vigilance by horse owners and veterinarians. Horses must be kept as confined as possible and daily inspection of the cast is required to monitor for cast sores, slippage and cast failure. Cast removal can be more involved and also may require general anesthesia. There are many times when two heads are better than one. 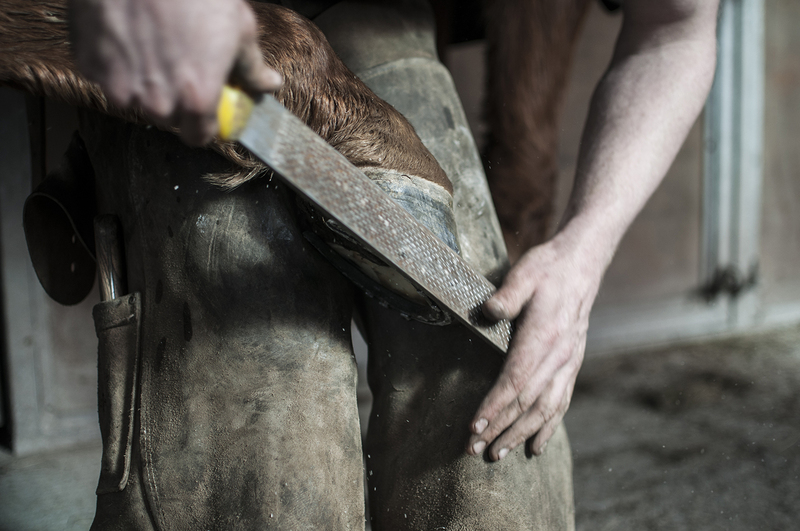 We offer consultations with your farrier for any hoof-related conditions. Many times radiographs can be helpful when setting shoes to check for angles, correct placement of a heart-bar shoe, evaluation of the coffin bone and depth of the horse's sole. We invite your farrier to come to our equine facility either to trim your horse's feet, or to examine radiographs we may have previously taken of your horse's feet. We believe complete cooperation between equine professionals leads to the best care and treatment for your horse. Please call if you or your farrier is interested in a consultation. The Kimzey Leg Saver Splint was designed to immobilize and protect fractures of the distal cannon bone, fetlock and pastern. We have two leg saver splints, one to keep the leg in flexion and one to keep the leg in extension. We have used these splints many times for immobilization after a cast removal and to support a limb following complete lacerations of the flexor and extensor tendons. Lameness in a horse can start as a very subtle change in performance or behavior. Other lameness can appear suddenly and be very dramatic and obvious. Common causes of lameness include injuries, infections, arthritis, navicular disease, hoof abscesses and laminitis. Whatever the cause of lameness, it should be addressed sooner rather than later for the sake of your horse's comfort and future athletic ability. Because there are so many different causes of lameness, it can take a lot of time and diagnostic testing to figure out exactly where the horse hurts. While some lameness cases can be quickly diagnosed and treated some get more involved. Athens Veterinary Service offers radiographs, ultrasound, and diagnostic nerve blocks to help us diagnose and appropriately treat your horse's lameness. We will be happy to provide you with an estimate of the time required and cost of the lameness workup. We are happy to offer digital radiography to our equine clients. We recommend bringing horses into the clinic for taking radiographs. Bringing the animals into the clinic has the benefit of developing the pictures right away so that settings and angles can be re-adjusted as needed for the best possible images. We understand that bringing your horse to our facility is not always possible so we do offer radiography at your farm or barn location. Our machine is capable of taking radiographs of most of the horse's anatomy with the exception of lungs, abdomen, and parts of the spine. There are times when a horse has been diagnosed with a lameness that will benefit from injecting specific joints with steroids and/or hyaluronic acid. Joint injections can be very successful in returning more normal movement to an arthritic hock joint, a sore navicular bone, or an old injury inflamed by activity. Joint injections always carry the inherent risk of joint infection and sterile inflammation and for this reason strict sterility is demanded by our veterinarians and staff. Joint injections can be done on the farm or at our equine facility. Injections are done only after a complete lameness exam and a diagnosis has been made. Soft tissue injuries such as a bowed tendon, hematomas, tendon sheath infections and annular ligament fibrosis can only be definitively diagnosed with an ultrasound examination. We offer ultrasound at our equine facility or at your farm or barn location.